Based on the above, it would seem that one should wear the Tzitzit in a way that one is able to see at least the strands of the Tzitzit. Indeed, Ashkenazim customarily untuck their Tzitzit strands and place them outside their pants and thus, are able to see them all the time. Nevertheless, the Sefer Ha’Itur (Hilchot Tzitzit, end of Chapter 3) and Mordechi (Hilchot Tzitzit, Chapter 943) in the name of his rabbi, Rabbeinu Meir of Rottenberg, write that the “Tallit Kattan” (known today as just “Tzitzit”) should be worn underneath one’s clothing and one sees the Tzitzit at the time one puts it on and fulfills the Mitzvah sufficiently in this manner. Nevertheless, even the Ba’al Ha’Itur at the end of this discussion quotes the opinion of Rabbeinu Yitzchak Maron Ha’Levi who writes that the Tallit Kattan should be worn on top of one’s clothes. Thus, one who wishes to fulfill this Mitzvah in the most halachically preferred manner should wear one’s Tallit Kattan over one’s clothing. Indeed, Maran Ha’Shulchan Aruch (Chapter 8) writes that the primary fulfillment of this Mitzvah is to wear the Tzitzit on top of one’s clothing “so that one may see it always and remember the Mitzvot of Hashem.” However, there is somewhat of a contradiction with regards to the opinion of Maran Ha’Shulchan Aruch, for elsewhere, he seems to imply that the Tallit Kattan should be worn under one’s clothing. The Ma’amar Mordechai writes that the opinion of Maran Ha’Shulchan Aruch is that it is preferable to wear the Tallit Kattan on top of one’s clothing, however, he did not ignore the fact that the prevalent custom was to wear it under one’s clothing and therefore, he writes certain laws in various places based on this custom. Indeed, the Bet Yosef and all Acharonim explain that the custom was that the Tallit Kattan, along with the Tzitzit strands, was worn under one’s clothing. The Bet Yosef likewise quotes the Rivash who writes that the primary fulfillment of this Mitzvah is to look at the Tzitzit while one recites Keri’at Shema and says the words “Ur’item Oto” as well as while wrapping one’s self in the Tallit. The great Sephardic Acharonim write that according to the saintly Ari z”l, the Tallit Kattan should be worn under all of one’s garments and this is indeed the Sephardic practice. Hagaon Rabbeinu Yaakov Rakach zt”l writes that the holy Ari himself would wear his Tallit Kattan under his clothes like the custom of Sephardic and Middle Eastern Jews until this very day. Nevertheless, Ashkenazi Jews customarily wear the Tallit Kattan on top of their clothes or at least take their Tzitzit strands out of their pants. This is the customarily the practice of Yeshiva boys today and in this way, wherever they go, people who see them realize that they Jews who are meticulous about Mitzvah observance. Approximately fifty years ago, there were those who wished to change the custom of Sephardic Yeshiva boys in that they should too begin taking their Tzitzit out in order for this Mitzvah to be conspicuous among other reasons. However, Hagaon Harav Ezra Attieh zt”l was steadfast that the Sephardic custom remain in place. 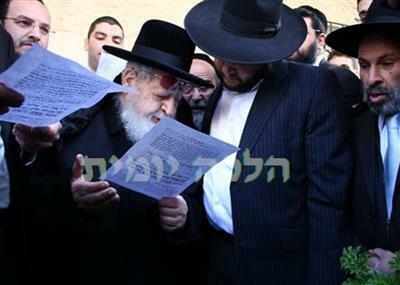 Halachically speaking, Maran Rabbeinu Ovadia Yosef zt”l was asked about this matter several times and his son, the great Rishon Le’Zion, Hagaon Rabbeinu Yitzchak Yosef Shlit”a discusses this matter in his Yalkut Yosef as well as in his Responsa Ha’Rishon Le’Zion, where he writes that although our custom follows the Mekubalim that we do not take out the Tzitzit at all, nevertheless, if one feels inspiration in one’s fear of Heaven as a result of taking one’s Tzitzit out, especially when this is being done to separate one’s self from neighbors who may not follow the Torah’s path, such an individual may take out his Tzitzit and later, whenever the opportunity arises, one should return to the authentic Sephardic custom and tuck the Tzitzit in. Similarly, Yeshiva boys who, for whatever reason, wish to take their Tzitzit out, may do so. Indeed, some of Maran zt”l’s grandchildren would take their Tzitzit out and Maran zt”l would see this and not say anything. After their marriage, these individuals returned to the authentic Sephardic tradition and tucked their Tzitzit in, in line with the opinion of the saintly Ari z”l. Summary: Ashkenazim customarily take their Tzitzit strands out. Sephardic Jews, however, customarily tuck their Tzitzit in. A Sephardic Jew who feels that taking his Tzitzit out will cause him benefit in his service of Hashem may take his Tzitzit out. In general though, Sephardim and Ashkenazim should follow their own customs and Sephardim who have always customarily put their Tzitzit in should continue doing so.